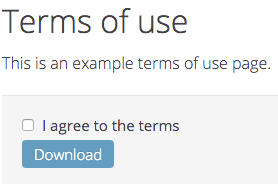 Simply add your licensing text to an article. Then, in the plugin configuration, select that article and the DOCman menu items for which this license will be shown before the download commences. When a user tries to download a document from one of those set menu items, the license will be presented and they will have to agree to the terms before the document can be downloaded. Select an article that contains your license text. Optionally, you can select DOCman Menu Items for which the license need to be shown.